Clippard uses acrylic manifolds in a variety of standard and custom applications. 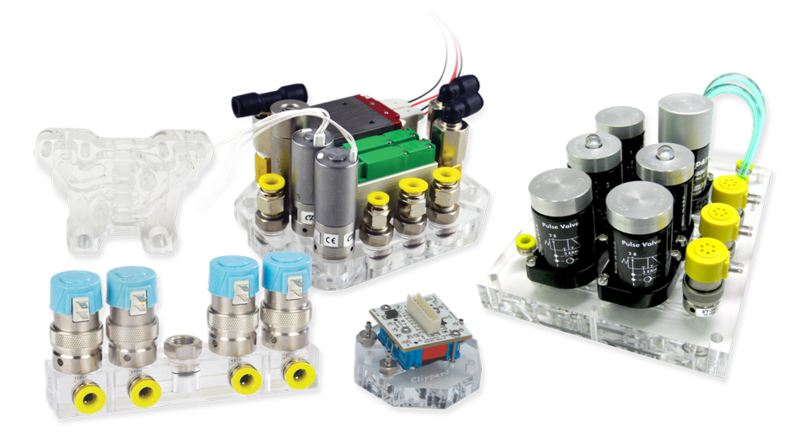 Customers may be familiar with Clippard's "VA" pneumatic circuits, which use modular valves mounted on acrylic manifolds to create single-function pneumatic circuits. For custom applications, Clippard can create acrylic manifolds with manifold or cartridge mounted valves, pressed in fittings, and complex flow paths to meet specific requirements or functionality. But what types of acrylic manifolds are there, and what do you need to know to incorporate one into your application? Acrylic manifolds can be categorized into three primary types, based on the fabrication methods used in their bonding—solvent bonded, diffusion bonded, and laser welded. Clippard utilizes both solvent and diffusion bonding, depending on the application. Solvent bonding is the most popular option. However, if your application focuses on microfluidics, diffusion bonding may be a better option for you. Read on to learn more about the differences. Solvent bonding uses a solvent to soften and dissolve material together, creating a chemical "weld." This is the simplest and lowest cost bonding method. It is best suited to designs with flow paths at least 0.125" wide. The biggest difficulty in solvent bonding is that solvent can sometimes squeeze into flow paths during the bonding process. This can be mitigated for critical passages by adding empty pathways that allow an escape path for excess solvent. Clippard uses GP cell-cast acrylic sheet. Standard manifolds are made from clear acrylic, but some limited colors are also available. The maximum plate size that Clippard can manufacture is 12" x 14". Standard plate thicknesses are 0.125", 0.250", and 0.500", and up to six plates can be bonded together depending on overall thickness. After the plates are machined, the solvent is applied to the bonding surfaces and the plates are aligned. The plates are pressed together and allowed to cure, and then any final machining processes are completed. The edges are routered and finished to make the bond lines nearly invisible. Then any laser engraving is done, as well as pressing in any threaded or push-quick inserts. Once the manifolds are completed, they move to assembly, where any valves, regulators, or other pneumatic components are threaded or pressed into the manifold. Only machine on bottom surfaces of plates. Machining from a single surface is less expensive, allows for better tolerance control, and prevents misalignment issues. Keep machining away from edges. Clippard recommends keeping at least 0.250" clearance between holes/pathways and edges. Allow ample distance between features. Clippard recommends maintaining 0.250" between channel-to-channel or channel-to-hole centerlines. Channels should be at least 0.125" wide. Clippard recommends a standard channel dimension of 0.125" wide x 0.150" deep. Typically the channels have square corners, but curved flow paths should have large radii to allow for shorter tool paths and provide better laminar fluid flow characteristics. Never use thread locker (Loctite) on acrylic. This may lead to crazing (cracking). Diffusion bonding uses elevated pressure and temperature to create a bond at the molecular level. It uses no additional chemicals to create the bond, which makes it well suited to medical and life sciences industries. It can also achieve very narrow flow paths and clean joints, allowing it to be used for precision applications such as microfluidics. However, it does require some trial and error for each new design to achieve the correct combination of time, temperature, and pressure. It has higher costs and longer lead times than solvent bonding. While acrylic is the primary material of choice for diffusion bonding, this process can also be done using Ultem, polycarbonate, and polysulfone. The material choice will depend on the application and material compatibility requirements. The maximum plate size that Clippard can manufacture is 10" x 10". Common plate thicknesses are 0.125", 0.250", and 0.500", but can be machined to any finished thickness before bonding. Up to six plates can be bonded together depending on overall thickness. After machining, the plates are aligned and placed in tooling that applies an even pressure on the top and bottom surfaces. They are then placed in an oven and heated to a specified temperature for a specified period of time. The increased pressure and temperature causes the atoms in the plates to slowly diffuse together, creating a bonded surface that is almost indistinguishable from a solid block of plastic. Once the layers have been bonded, any final machining processes can be completed and the manifold can be polished as necessary. As with solvent bonded manifolds, once the manifolds are completed, fittings can be pressed or threaded in, along with any valves, regulators, or other pneumatic components. The standard assembly grease is Dow Corning Molykote 33 Light, although special assembly lubricants can be used upon customer request. Top and bottom surfaces can be machined. Both top and bottom surfaces can be machined to create custom pathways or component surfaces as needed. Small pockets for fluid or air reserves can be created. Clippard recommends maintaining spacing of at least double the groove width between channel-to-channel or channel-to-hole outer edges. Channels can be as small as 0.020" wide. Clippard recommends making channels as large as possible though, as this allows for easier machining when drilling access holes after assembly. Channels can be a rounded or square profile depending on the application needs. Laser welding uses focused laser radiation to bond material. It typically requires the use of a special acrylic and a pre-bond coating. The pre-bond coating inhibits the laser from passing through the acrylic, causing the laser to heat the surface where the pre-bond is applied. Substantial surface preparation is required for the bonding surfaces to ensure that they are perfectly flat and the pre-bond is applied at uniform thickness, otherwise voids can form during the bonding process. Successful laser welding can create clean, high tolerance flow paths. There may be some discoloration to the material on the bond line. Clippard acrylic manifolds provide integrated circuits and a place to easily mount many types of components with convenient locations for connections, making them an attractive, efficient alternative to traditional valving systems. All interconnections are machined right into the acrylic, reducing the amount of piping needed and ensuring highly accurate connections. Component identification can also be etched right onto the surface of the subplate to identify every input, output, and valve. This keeps the pneumatic circuit lightweight and neat which allows for fast, simple assembly, visual inspections, and maintenance. Clear acrylic manifolds are ideal for applications where pathways may need to be inspected for cleanliness, or manifolds can also be manufactured in a variety of colors including red, black, blue, or yellow. Questions? We're happy to help! Clippard has extensive experience designing custom acrylic manifolds, and our engineering team can even design your manifold for you. Contact us today to discuss your application.